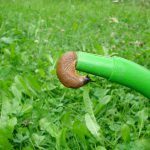 Slugs are found outside around vegetation and items in contact with the soil, and they hide in damp places during the day. They are considered significant pests by many gardeners, as they feed on and damage many types of plants. Damp, mild and calm conditions cause favorable temperature and moisture conditions to increase slug activity. Slugs will create a slimy trail wherever they crawl. Large numbers of slugs can develop around a home or other buildings, typically being seen on decks, patios, and even indoors. Snails are primarily nocturnal, preferring to feed in the evening or on dark days. Slugs have a good sense of smell and are often attracted to pet food, kitchens or pantries. It is common to see slugs feeding on pet food left outdoors, making to food undesirable due to the slime left behind. Slugs can survive in damp basements and crawl spaces. They have no skeletal structure which means they can squeeze through amazingly tiny cracks. Common entry points include the spaces under doors, gaps for water or gas pipes, joints along walls, cut-outs for furnace and dryer ducts and gaps for electrical wiring.